Reeza walked out to bat on his ODI debut after Quinton de Kock got out for just two runs. 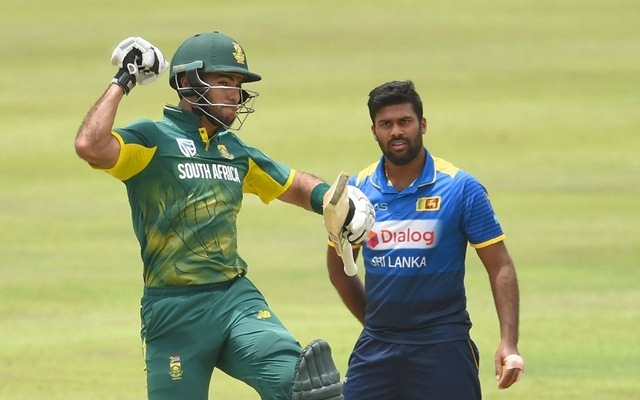 Reeza Hendricks made most out of the opportunity he got in the 3rd game of the 5-match ODI series against Sri Lanka as he scored a quick-fire ton. Hendricks was drafted into the playing XI in the place of Aiden Markram, who had low scores on the tour of the Island nation thus far. Hendricks scored an 89-ball 102 with eight fours and one six while batting at No.3 after Sri Lanka invited t9 hem to bat first. Reeza walked out to bat on his ODI debut after 5 overs. Quinton de Kock got out for just two runs after a 42-run opening stand in six overs with Hashim Amla. He opened his account in this format with a boundary on the 2nd ball he faced. Hendricks kept the scorecard ticking and rotated the strike though he didn’t hit boundaries regularly. He shared a 59-run stand in 11 overs with Amla for the 2nd wicket and reached a fifty by the 20th over in 49 balls. He raced to an 88-ball century with his last 29 runs coming off 18 balls. Hendricks put on a 78-run stand in only 73 balls for the 4th with JP Duminy before he was cleaned up by Lahiru Kumara soon after completing his hundred. Hendricks became the 14th player to score a century on ODI debut and the 3rd South African after Colin Ingram and Temba Bavuma. He is also the 5th player to score a century on ODI debut against Sri Lanka, the most times a country has been on the receiving end for such a feat. 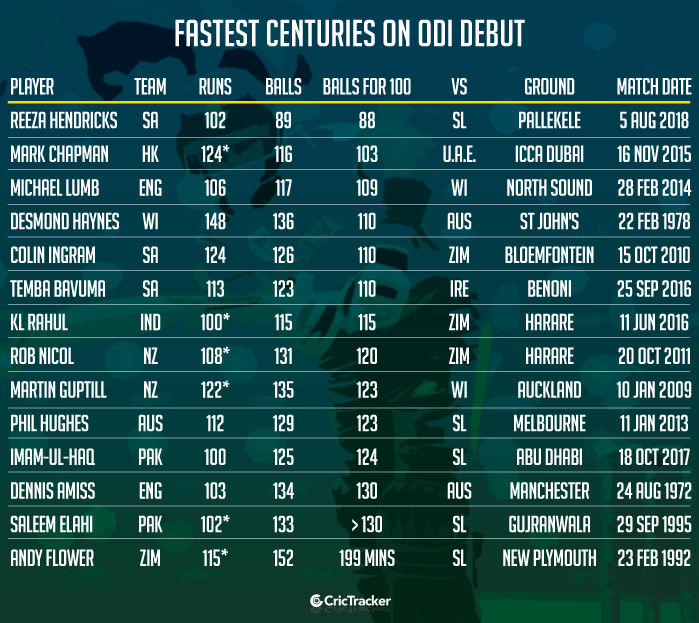 Hendricks’ 88-ball century is also the fastest century by any player on ODI debut surpassing Mark Chapman’s 103-ball hundred. The current New Zealand player made his debut for Hong Kong in the WCL 2015 against UAE. Michael Lumb scored a 109-ball century for England during a chase but ended up on losing side. The last man to score a century on ODI debut, Imam-ul-Haq, brought up his hundred off 124 balls which is the 4th slowest among the 14 centuries by players making their debut in ODI format. For all the latest cricket news and other updates follow CricTracker.